ThinkPad, that’s a name we all know in the consumer electronics space. Normally we’d think about one of those consistent looking enterprise laptops coming from a long lineage, but this time around, it’s being morphed into a full-fledged tablet. At Lenovo’s outdoor booth area at CES in Las Vegas, we managed to get some hands-on time with the Lenovo ThinkPad Tablet 2, which is none other than a slate running the full Windows 8 experience – as opposed to the watered down Windows RT experience. For a tablet, we have to admit, we’re digging the slim size it’s packing along for the ride – while also admiring the subtle ThinkPad design DNA it’s boasting too. Digging the size and balanced weight of this one, you can turn it into a distinctive ThinkPad laptop by attaching the optional keyboard dock to it. Strengthening its overall usability, it even manages to carry along a very useful digitizer stylus that presents users with a way to quickly jot down notes or draw – similar to what we’ve been seeing with Sammy’s Note stuff. Smack dab right there in front of us, its 10.1-inch HD 1366 x 768 IPS screen with 10-finger multi-touch support looks pretty superb when pitted up against other things. On top of that, if you’re worried about battery life with this skinny looking fellow, it’s mentioned to put out roughly 10 hours out of juice. However, if you pick up the optional keyboard dock, it’ll increase the total by a little bit more. Being Windows 8 and all with its fancy schmancy start screen, it naturally moves swimmingly with its performance – and that’s know it’s packing a 1.5GHz Intel Atom processor with 2GB of RAM inside of its streamlined body. As we continue to see an increase in Windows 8 slates, it’s only going to become harder to be distinctive enough to stand out prominently. Sure, it doesn’t boast a killer industrial design like some of the other recent tablets out there, but if you’ve been a fan of the ThinkPad series, maybe this might persuade you to make the switch to a tablet – even more when its base price starts at $649. its a nice tabelt..but hoping that it is a revamp generation on intel atom chips! 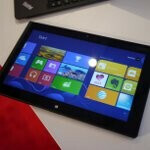 but still i think people should also make AMD chip base windows 8 tablet! I too am hoping for a amd powered tab, lets just wait and see. Oh and btw i love this idea tab more than all the other win 8 pro tablets. Finally someone managed to fit in a proper processor and none of that arm crap, and have no active cooling at the same time. Thumbs up for that. Waiting on AMD and a 7-8 inch screen. Actually comes with atom 1.8 duel not 1.5. Were do they get these writers? Oh and get a Nokia 920 can instead of your blurry 2007 I am.